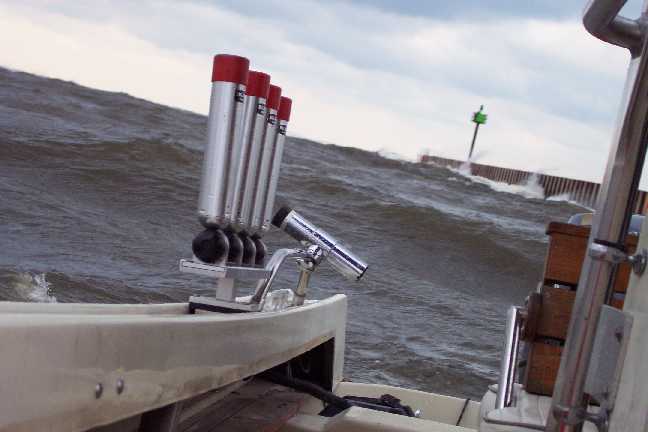 In case you were wondering if the boating season was finally over on the Great Lakes, the answer is 'yes', it is over for most of us, but there are a few Boston Whaler owners that want to stretch things a bit. 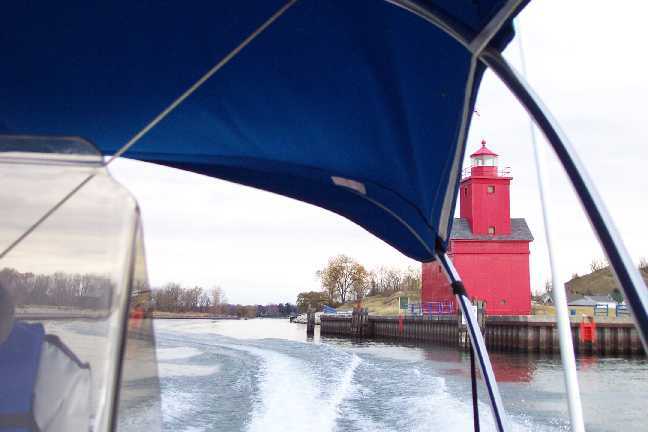 Since they have great confidence in their boats, they take them out into the Great Lakes on those late fall days, long after most boaters have laid up their bow-riders for the season. Pete Ferguson is the leader of "Team Xtreem", and besides being wild enough to go out into Lake Michigan in November, he is also handy enough to take his digital camera along with him and kind enough to send these great photographs. So instead of featuring a boat, this week the camera focuses on the water and the cold gray waves of Lake Michigan in November. "[I] found out that Randy [Crum] needs to pull my boat to get it into winter storage so Team Xtreem decided to make one more Saturday run. 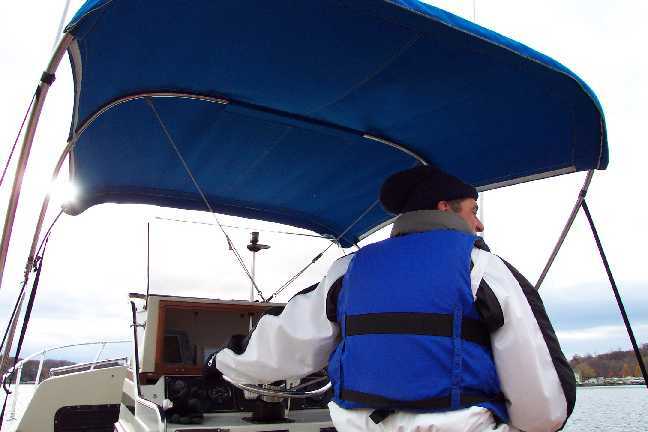 Bill Lalley and Derk Visser were kind enough to go on Reliant's final voyage of the season (November 11, 2000). The weather was cloudy and cool with the air temperature running in the mid 40's. 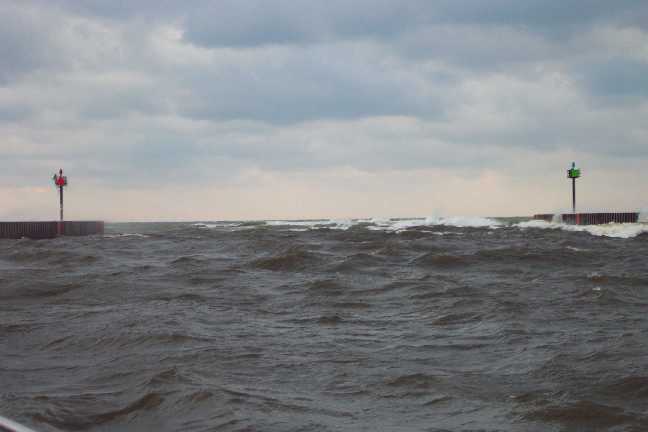 Lake had a modest two-foot swell running. 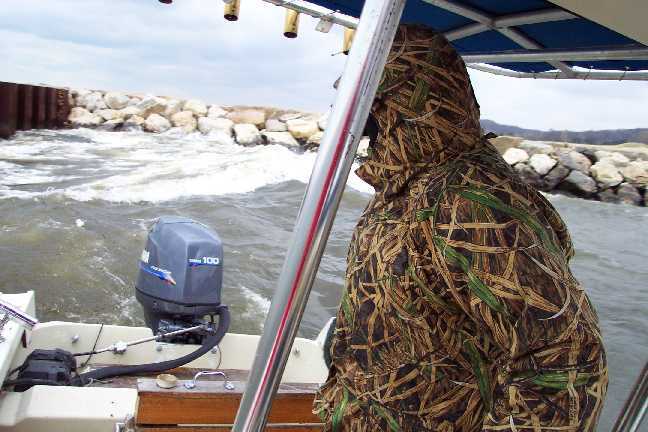 As you can see from the pictures, keeping all skin covered is a necessity in these conditions, particularly as we were running the boat between 38 and 43 MPH the entire time. 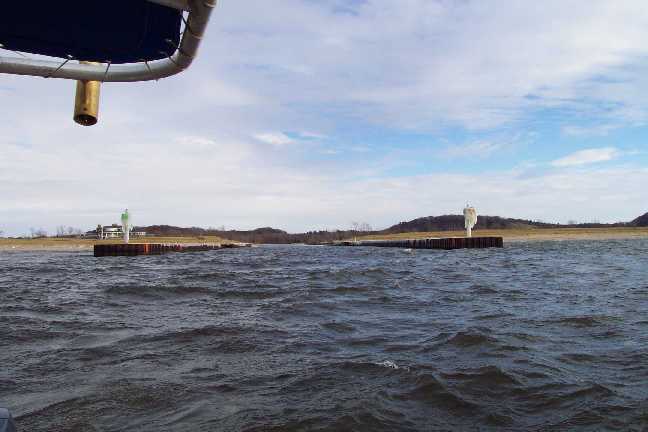 This time of the year we do not slow down for anything, including running the Holland channel at full throttle! Breakin' the law, Breakin the law'". If these guys look cold, imagine how the lower unit feels. Now is when you start thinking about ordering the side curtains. The lake looks inviting, even if the water temperature is in the 40's. In November, the rules are different. Out into the lake for a run they go! 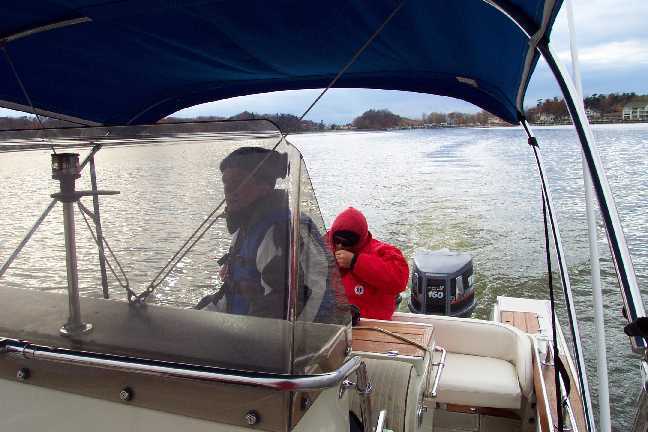 With the air temperature in the 40's and speed about 40-MPH keeping skin covered is essential. "This Sunday (November 19, 2000) Randy Crum was kind enough to take me out in his 1975 Classic Outrage 19. He had just put a Yamaha 4-stroke 100 HP motor on the back and is in the process of restoring the rest of the boat. 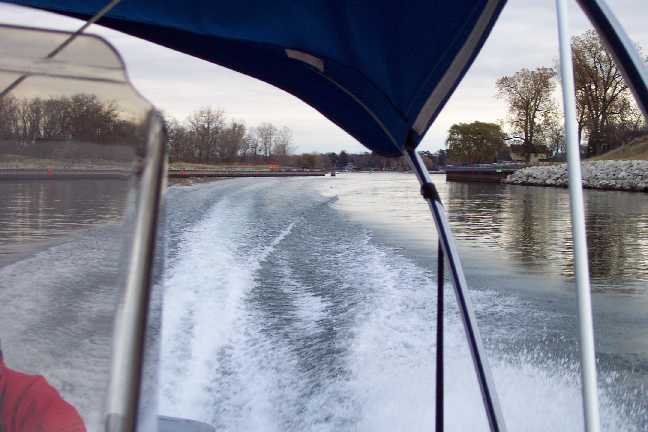 We put the first hour on the engine going down the Kalamazoo river channel and back. The engine is super quite and smooth. 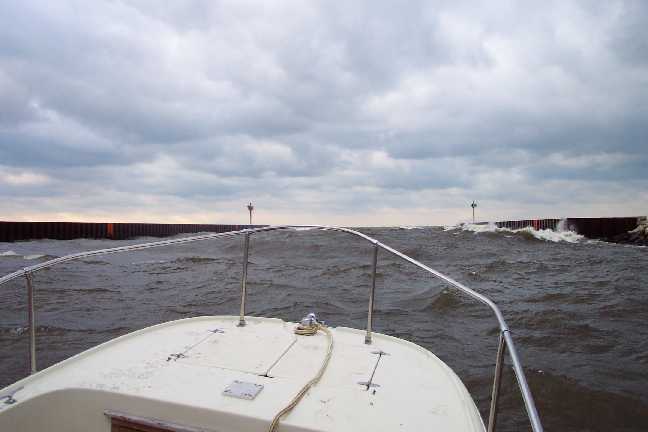 I have to admit that when we were at the end of the channel in the bigger waves, I asked him, a little nervously, if the engine had stalled as it was so quiet it was impossible to hear over the roar of the waves. 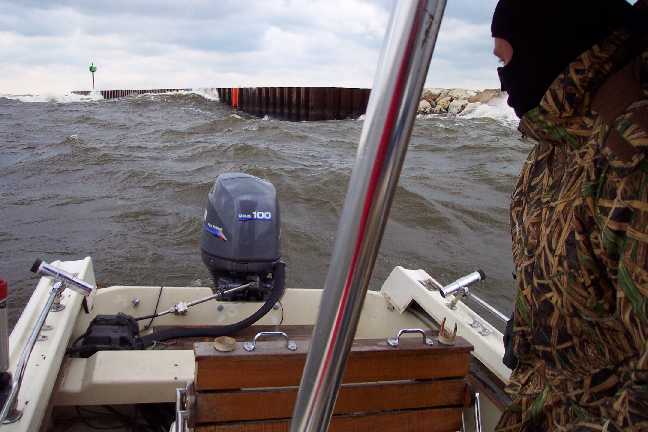 "As you can see from the pictures, the lake was rough with waves running seven feet. The air temperature was running in the mid 30's and it was a little chilly. 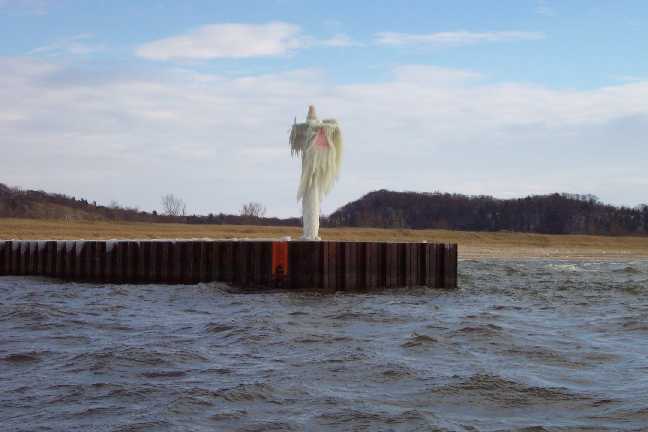 Since we were just breaking in a new engine, Randy decided to not go out into the lake." 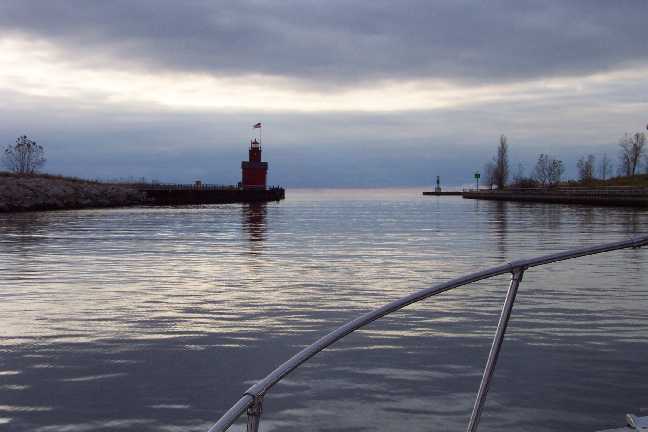 On days like this (November 19, 2000) you have the whole lake to yourself! Is that ice forming on the bow rail? 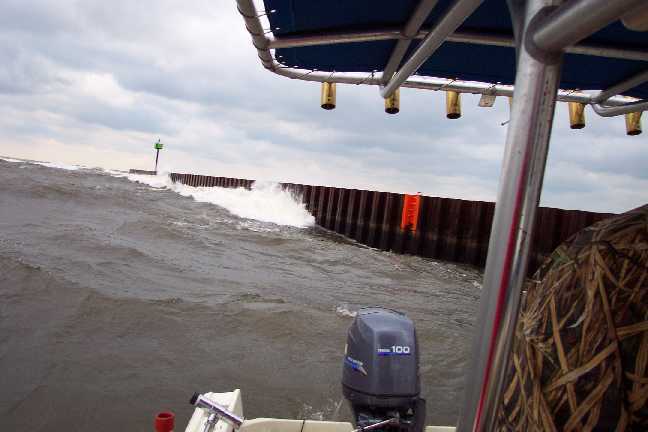 With a 70 mile fetch behind it, Lake Michigan rolls in. Can you still hear the engine running? Wave height is measured from trough to crest. The new Yamaha 100 HP 4-stroke is still running. Statistically, a wave of twice the average height occurs once every 1,000 waves. Plenty of time to get the planer boards out next year. Perfect weather for that engine check-out. "Team Xtreem reached the limits of our technology on Thanksgiving Day. 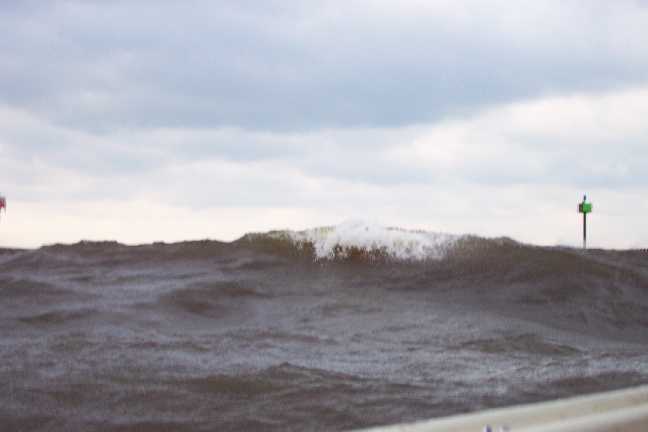 Once again Randy was kind enough to take me out in his Outrage for a little Turkey Day wave jumping. The air temperature was in the 20's and as you can see from the one photograph, we had to break ice both leaving and returning to the slip. 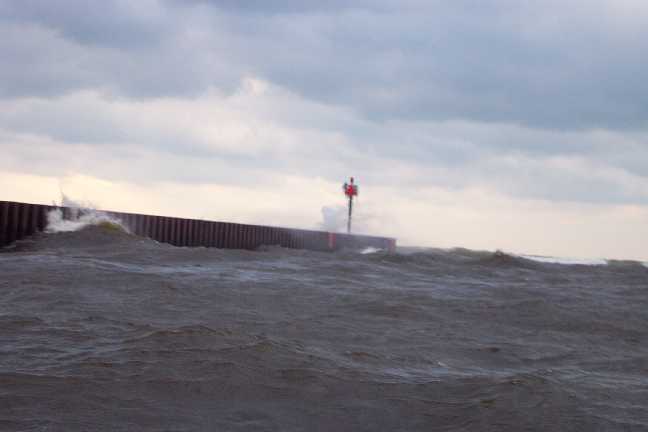 The pier heads were encased in ice and after the unavoidable spray from wave jumping on the big lake, so were we! At one point my digital camera even froze and I had to tuck it inside my mustang jacket until it warmed up enough to function again. We finally decided to go in when Randy noticed that we had pulled the bolts loose that anchor his T-top to the deck. 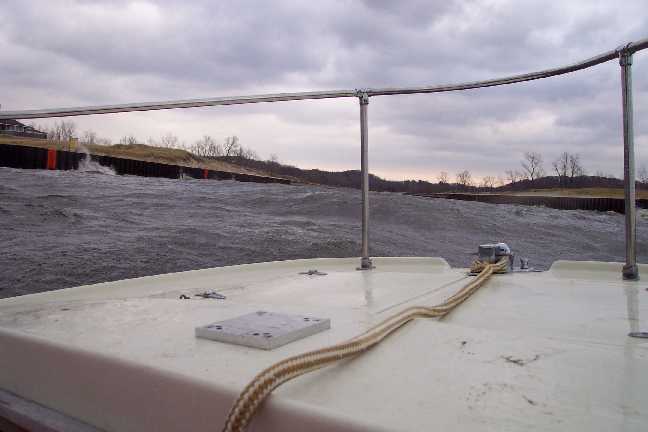 Normally we would have noticed the loose bolts sooner, but, the boat had two inches of snow frozen to the deck." Over night the temperature had been in the teens, and the naviation markers at the pierhead showed the effects of those conditions. 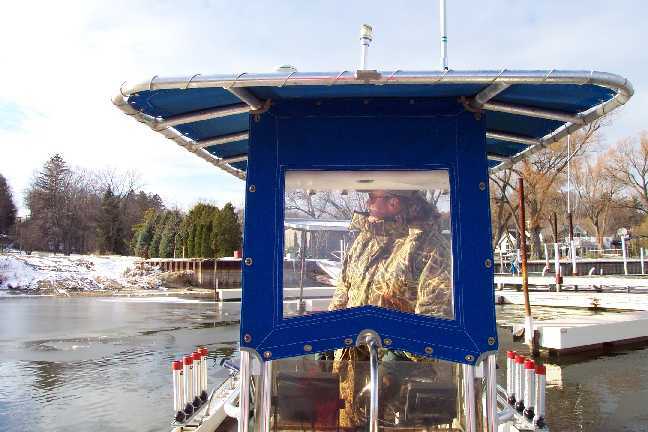 With the boat loading with ice, it was time to head back and get off the lake. 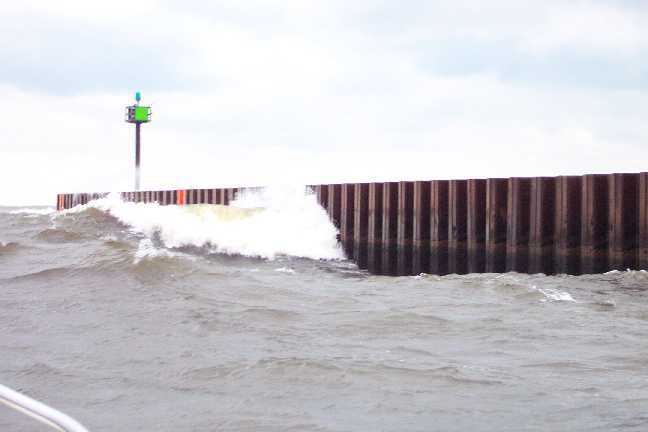 Again, thanks to Pete Ferguson for these great photographs of Lake Michigan in the fall. 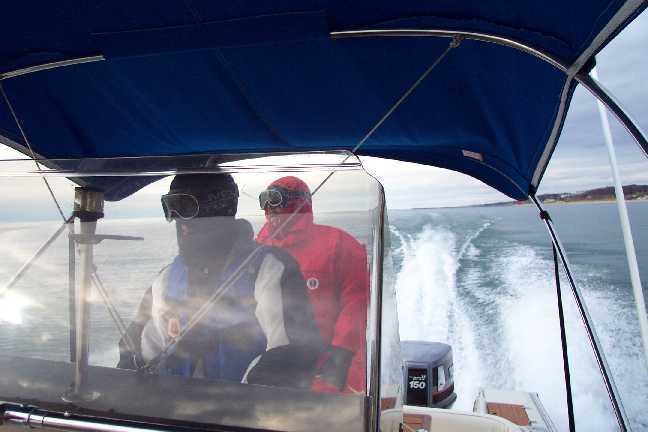 Of course, they were all taken from classic Boston Whaler boats!